It would be lovely to see you there! 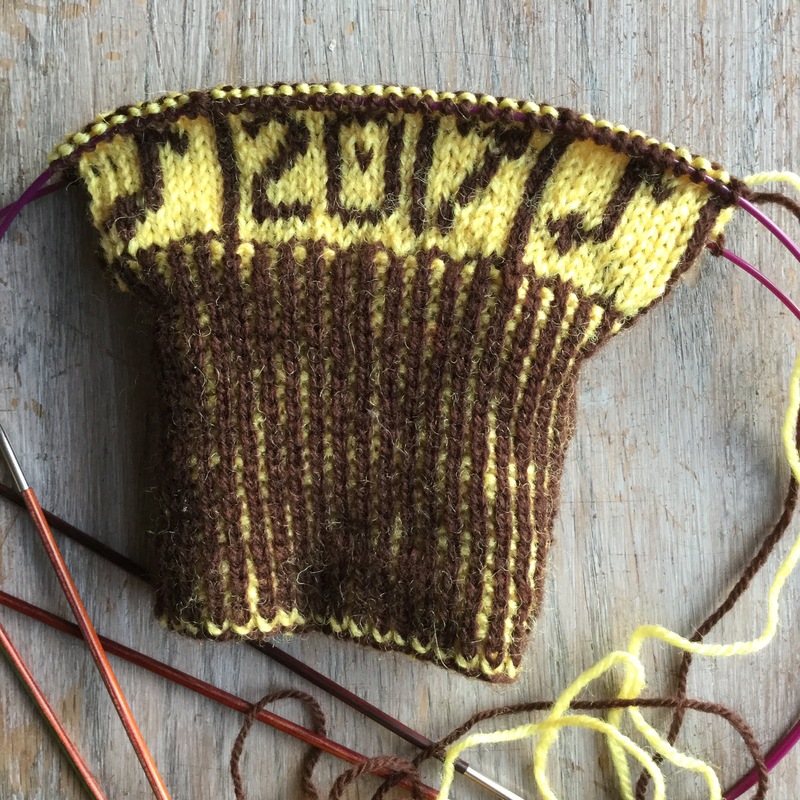 I’ve been travelling again during September and October and not getting half as much knitting done as I’d planned (that’s a surprise). The first week I spent in France and Spain, travelling by train from home, Eurostar to Paris and then daytime TGV to Toulouse. I was certain that this would allow hours of knitting time. We, that is me and partner, had to get up so early for the first Eurostar that once on it, I slept soundly most of the way, waking up just outside Paris thinking we were in Lille. So no knitting done between London and Paris. Getting across Paris from the Gare du Nord to the Gare Montparnasse also proved to be hard work as was queuing for almost an hour on the train at the buffet. It made what we used to call British Rail look absolutely perfect! So not so many undivided hours left there either. I was fortunate to be timetabled to present my paper on the first day which is always a relief. Here I am waving a pair of Sanquhar gloves around. I had the chance to have a little look around Vancouver which I liked very much. Here’s a little taster: some interiors of a church and a fabulous Art Deco building, views of the harbour, and the hotel where the conference was held, the Sheraton (very posh!). The final keynote speech was by Charlotte Kwon about her business importing crafts from India, Maiwa. It was absolutely fascinating to hear how she and her team have done this over the last 30 years. Have a look at the web site to see what they have produced in India and how they support the artisans they buy from. It’s inspirational. The next part of the trip was to California for a family visit and this we (me and partner, Gordon) did this by bus and train. Bus from Vancouver to Seattle, and then sleeper train from Seattle to Oakland, California. So that’s all for now. California happened in October mostly and includes a couple of great wool shops so look out for the next newsletter. I hope you’ve read this far – if so, thank you! I think this is a case of better late than never – I nearly didn’t bother because it’s so late in the month. 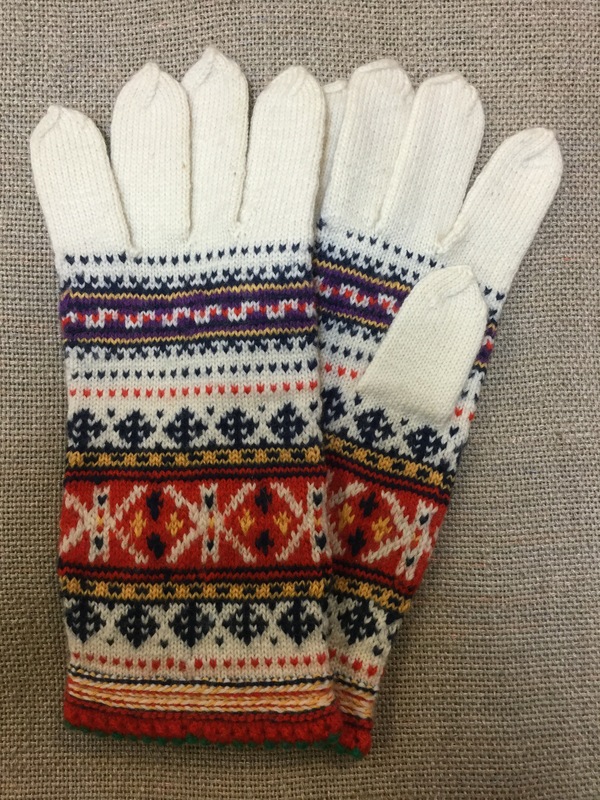 However, I have been busy knitting, trying to complete the four pairs of gloves I’ve called the Nature Series. During August I also walked the Yorkshire Three Peaks, visited Wales, went to London and got ready to go to the Pyrenees. I’m now preparing to go to Vancouver, Canada for the Textile Society of America biannual symposium, for which I have had a paper accepted. It’s about knitted gloves, specifically those knitted in Sanquhar. I’m going to put in some pictures of all these things and hope to write more for next month. and here’s just a finger on John’s pair: I don’t have a name for this pair but I do like them. And so that’s all for now. 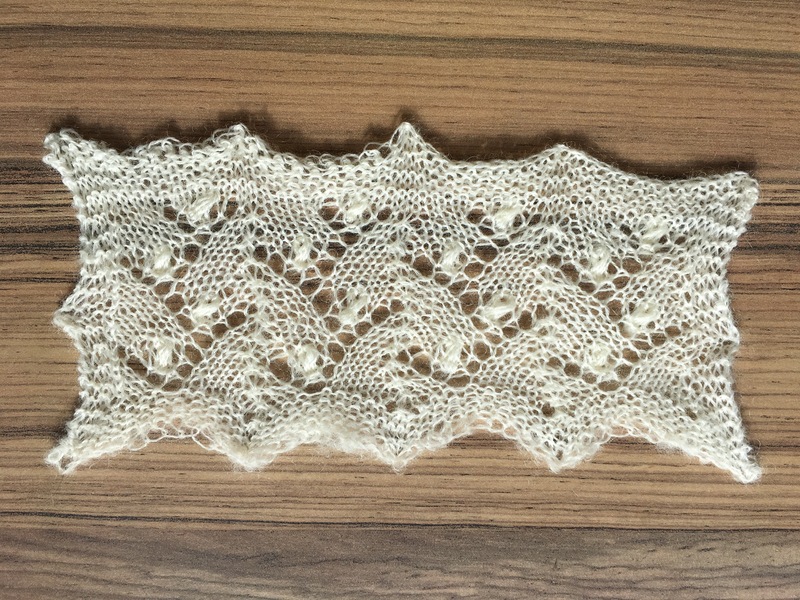 I do post occasionally on Facebook, more personal things, and on Instagram for knitting things. I could say this newsletter is late because of the snow … which actually wouldn’t be true at all as the snow has not held me up! It has stopped me making a trip to the very west of Wales where I have a caravan overlooking St David’s Head but that’s all now put back a week so I’ve had more time at home not less. So what’s being going on knitting wise? I’m machine knitting at the moment. This is a fine 3ply wool sweater for my partner, Gordon, to wear under his McNair walking shirt, a Christmas present from me. The McNair shirt is made in Slaithwaite, a village near Huddersfield where we live, and is a great example of local small scale production. You can read all about it here, on their rather slick web site. The shirts are not cheap and raise all the questions about how much we are prepared to pay for our clothes, showing it is that global capitalism has made mass production of so many goods so cheap that we can treat them as disposable blah blah … I’m sure most of you are familiar with the arguments on this. Anyway, it was a lot of money, like anything made in the UK that pays the maker anything more than living wage. Gordon had been wearing an old cashmere jumper of my father’s under it. 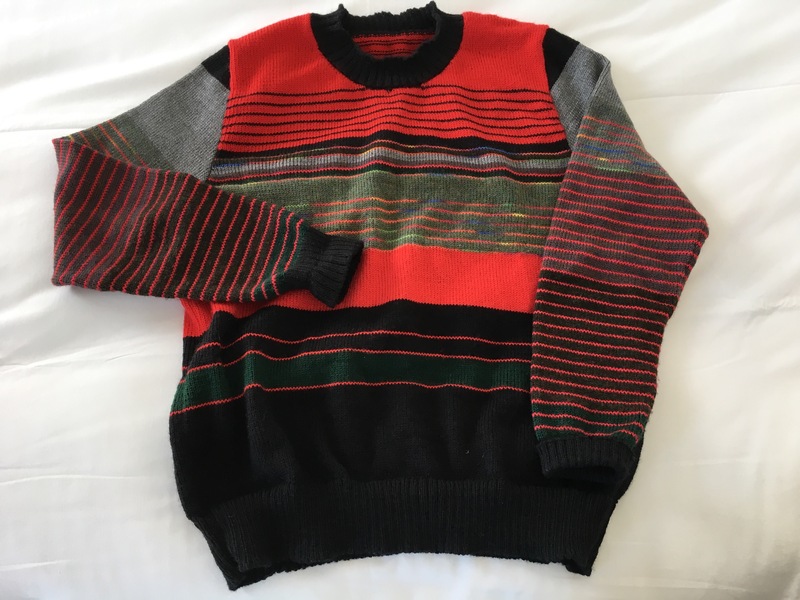 This goes back to when I worked in the knitwear industry and sometimes visited factories that would have garments on offer, so this is a beautiful garment, classic bottle green etc but with a moth hole right in the middle of the front, probably where some food or drink’s been spilled down it. No amount of mending, visible or invisible, is going to restore it to its former glory, but as an underlayer it’s perfect. However, a change is needed from time to time even if all these wool garments do hardly ever need to be washed, hence the call to action. I suggested buying a merino base layer but when I admitted that I have some 3 ply pure machine washable wool on cone, a rare beast indeed, an order was placed. So it’s almost there, not quite enough for a photo though. 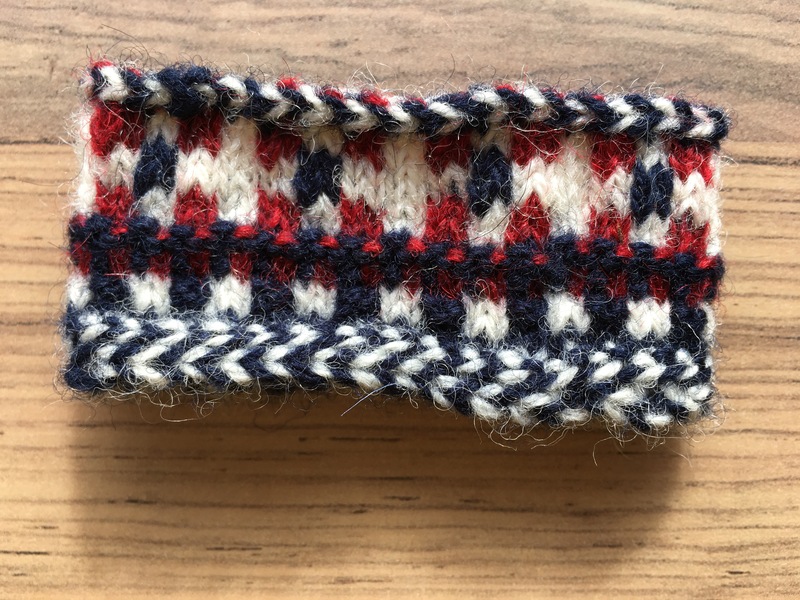 I love machine knitting but as a process it’s not very photogenic, (unlike say hand spinning) which is a shame so here’s some not very attractive pics: (I don’t think machine knitting is meant for blogs or Instagram). This is the start – the tension swatch, the working out and notes including the special green ruler for reading off stitch and row gauge. 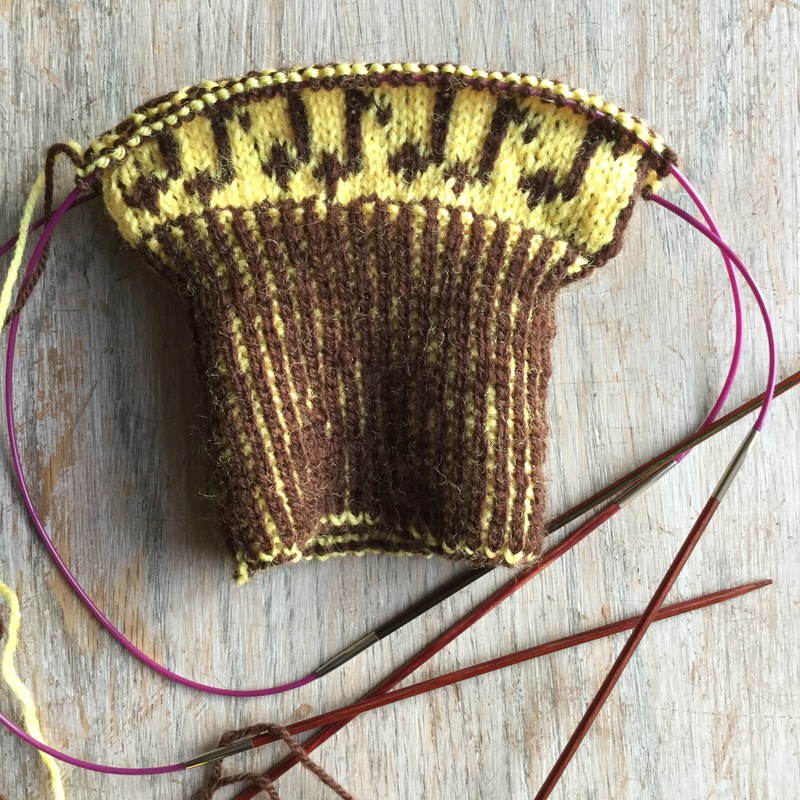 And while I was working out the shape of the garment, I had to search for a sleeve top shape and sound everything I needed on the Knitting & Crochet Guild web site here under the heading ‘Finding out more about designing’. It’s a mine of information and highly recommended although it’s not what I’d term designing, more pattern drafting. The blue is the garment and the yellow and green are waste yarn, used a lot on the machine. Machine knitting is a great way of producing good quality garments quickly, or it can be combined with hand knitting or crochet to make items like blankets such as this one, featured some while ago. The central panels are machine knitted on my chunky machine and the deep border is double crochet. The yarn is all my own indigo dyeing, some over natural greys and dark greys. Design inspiration Amish and Welsh quilts by the way. 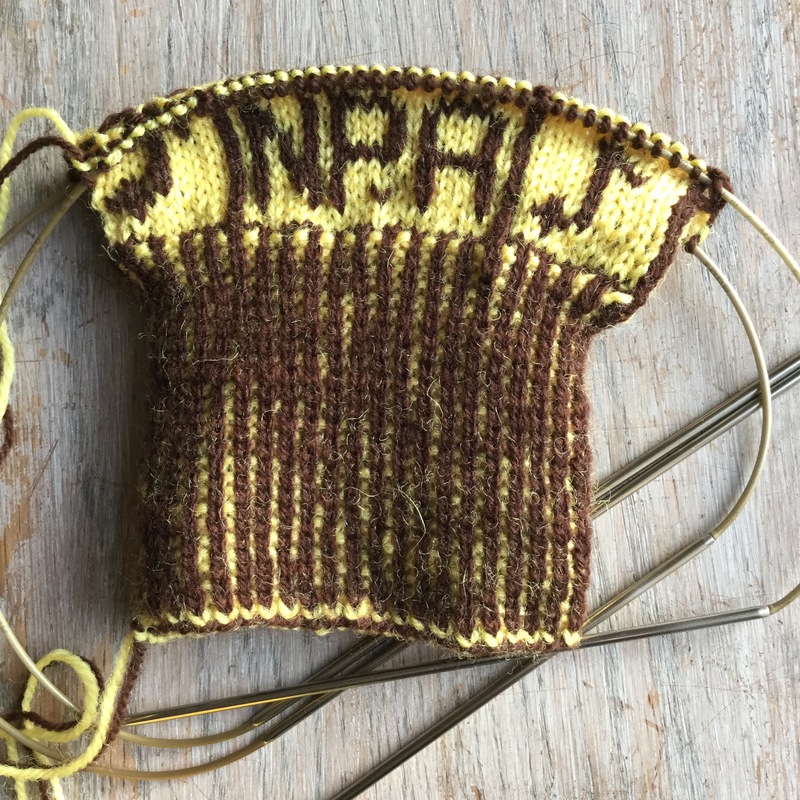 I’m also carrying on with hand knitting gloves for my friend Jenny a process not without upset as I had to undo about 3 hours of work when I realised that the yarn I was using was just not the right thickness. I do my utmost to use only stash yarn for these gloves and I’d run out of the perfect vintage pure wool 3 ply in the exact right shade of red, so I put in a heavier red which didn’t work. It’s on the white background, 2 pics, below. I then found a very thin pure wool on cone, and have continued with that. All is ok and progress is again being made. And I’m also thinking about exhibitions, workshops and a lot of travel …. and hosting Beth Brown-Reinsel at the end of the month – thanks for the heads up Beth in her recent newsletter. 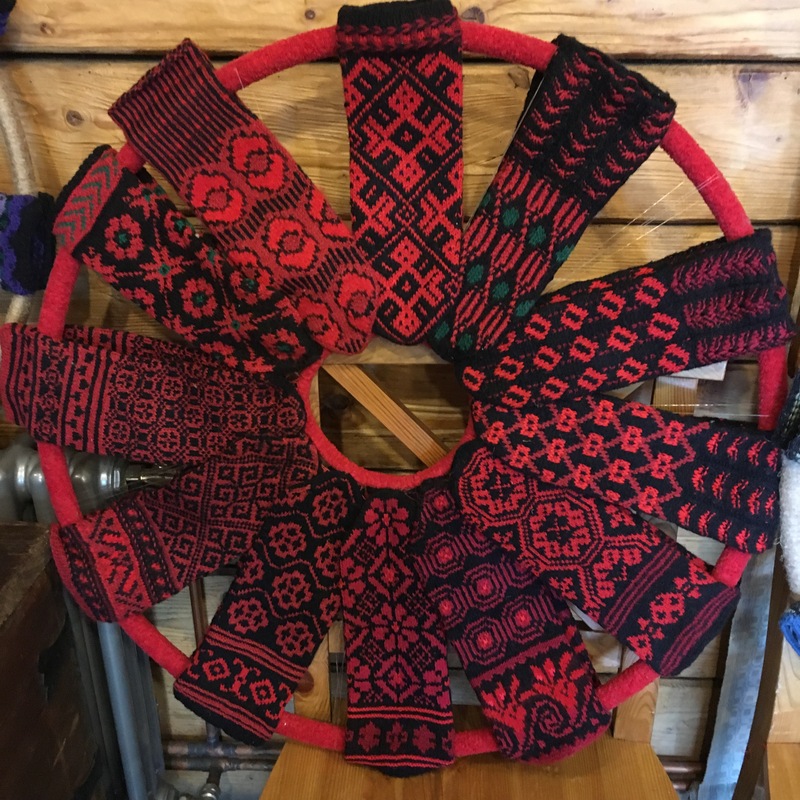 I almost forgot to say that I have finished one or two of my many half finished projects … a couple of Estonian wristwarmers. The month started with a visit to Estonia for the annual Craft Camp, my third time. I took workshops in knitting with Kristi Jõeste and Riina Tomberg, both of which were excellent. 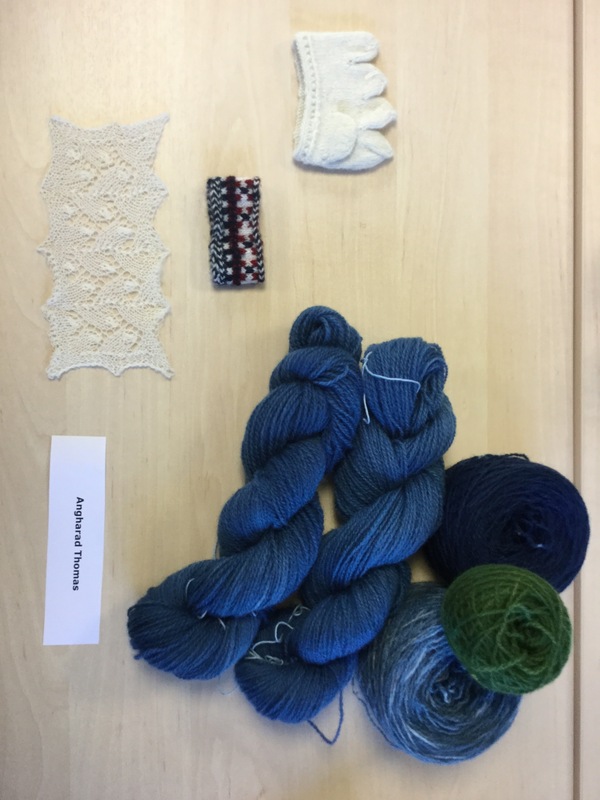 The other two workshops were indigo dyeing and Happsalu lace, again, both were excellent. The samples I produced are below and I hope you can tell which is which. 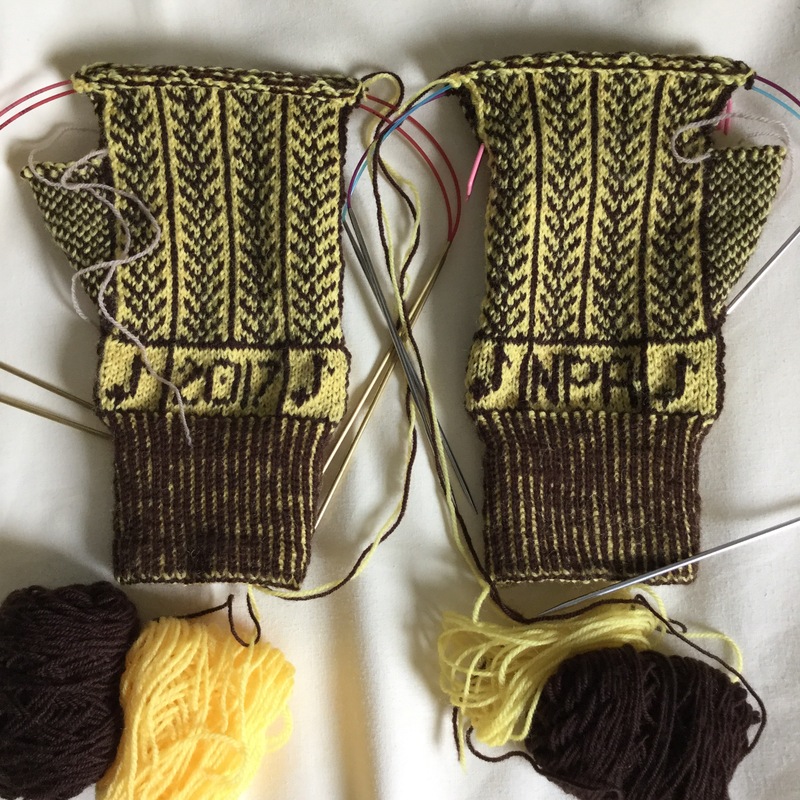 My own knitting which is ongoing is the gloves for Nick, almost complete. The other pair, for Jenny, are in the planning stage and I’m wondering whether to introduce some Baltic style patterns and techniques that I’ve seen and learnt in my visits to Latvia and Estonia this spring and summer. These are actually almost complete, just the thumbs to knit, but I don’t have a more recent photo and I’m away from home in the very west of Wales. Farfield mill, outside Sedbergh, have invited me to show my gloves, planned for September and October. I went there on my birthday to discuss the arrangements accompanied by my partner and London grandsons. We stayed at Ingleton youth hostel and then visited Dent, home of the ‘terrible knitters’, and of Mary Allen, who was known to knit the patterned Dales gloves. Fewer than 20 pairs of these survive in collections in the U.K. So that’s it for now, I’m battling very slow internet and an iPad so perhaps more later in the month. the folk costume and textile centre in Riga. It was a packed programme including several workshops with glove and mitten experts, visits to museums and cultural centres, and a tour of the city where we were based for most of the trip, Leipaja, Latvia’s third city. Here are some pictures from that visit. 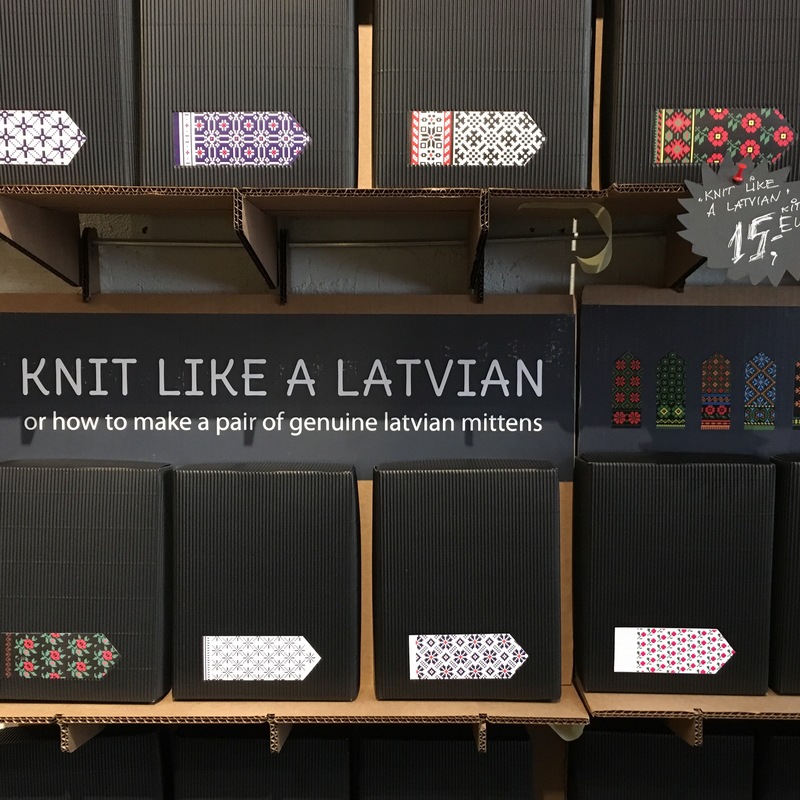 There are more in the Ravelry group ‘Knit like a Latvian’. These are worn at funerals, hence the black. It’s all machine washable, very important I think. The weekend of talks and workshops planned for March and postponed from then, took place over the weekend of 17th and 18th June. There was a heatwave in the UK then, so it was hard to even think about gloves of any sort, let alone woolly ones! 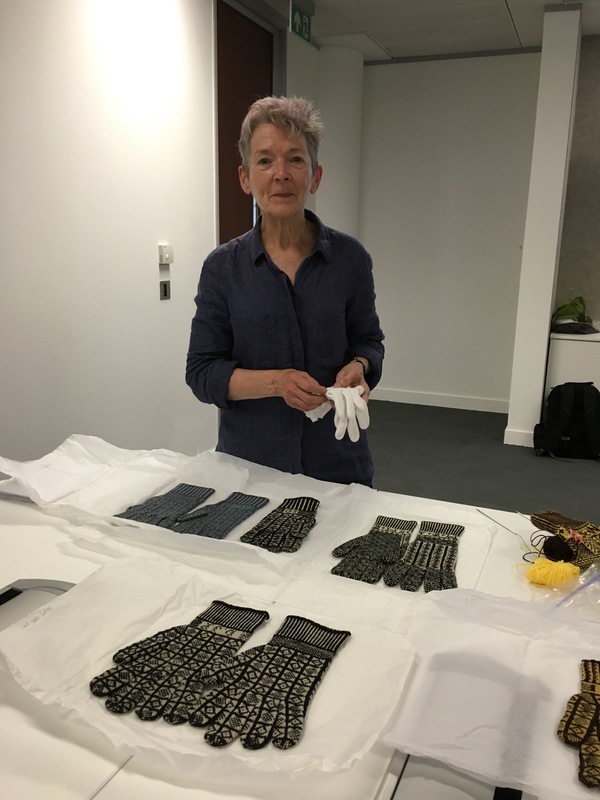 Here I am at the Knitting & Crochet Guild London branch meeting, the host for the talk, with the vintage Sanquhar and Yorkshire Dales gloves from the collection that I took to show. huge thanks to the participants for making it a very enjoyable occasion. 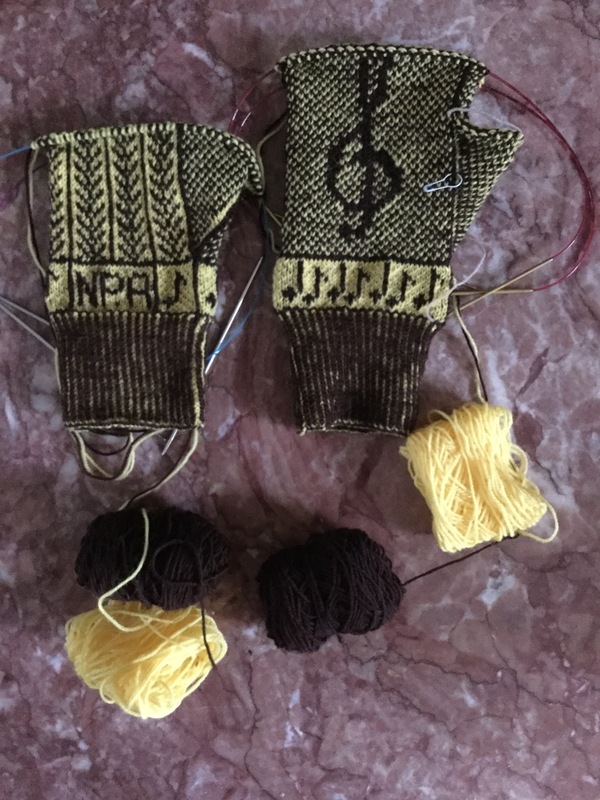 Here’s the hands with what was produced: by the way, the aim was to produce a sample with the techniques needed to knit gloves. On the glove knitting front I am working on 2 pairs for very old friends. The first pair has a musical and Yorkshire theme, as befits the potential owner, a musician with family roots in Halifax. 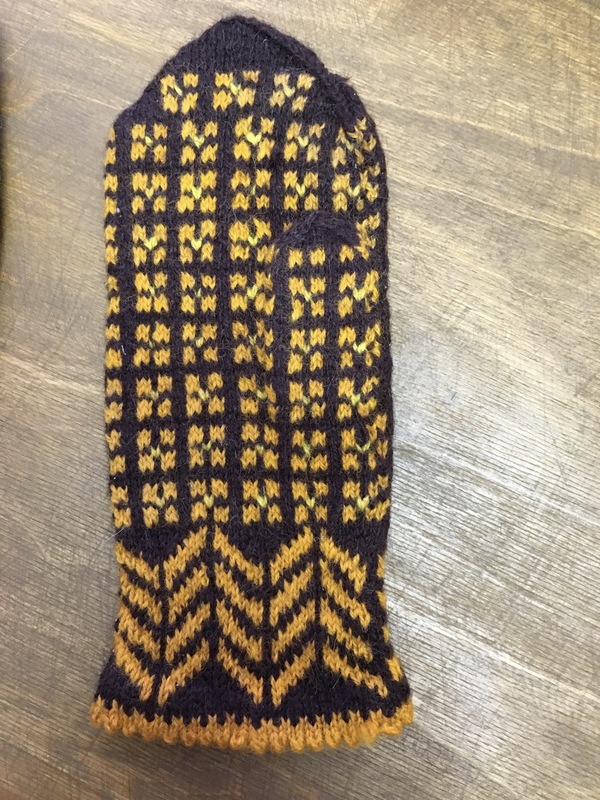 He chose the vintage colours as seen in a pair of Sanquhar gloves, yellow and brown. 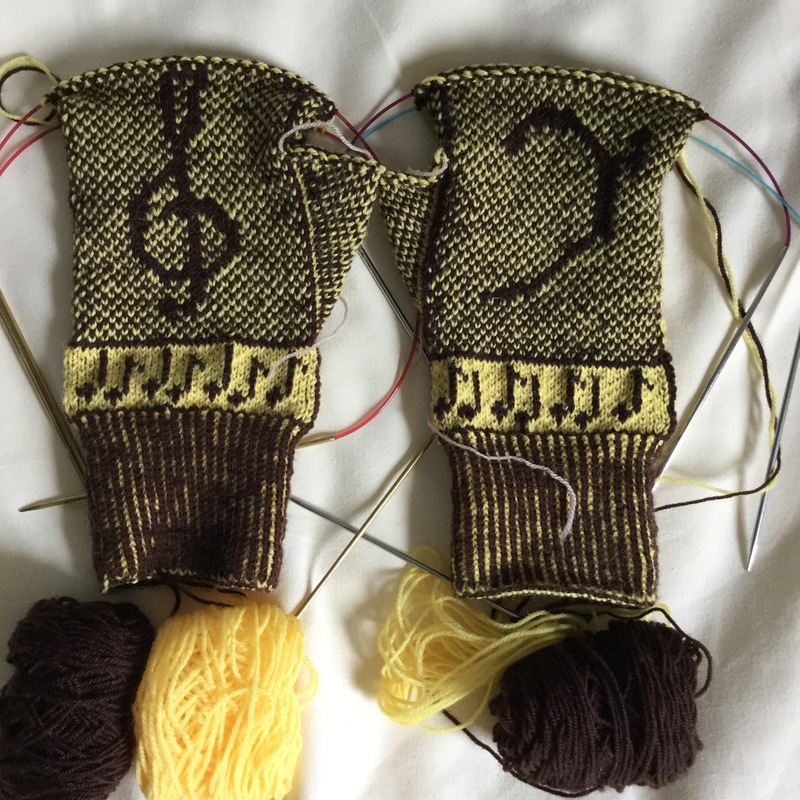 There’s crochets and quavers round the wrists and treble and bass clef son the palms. 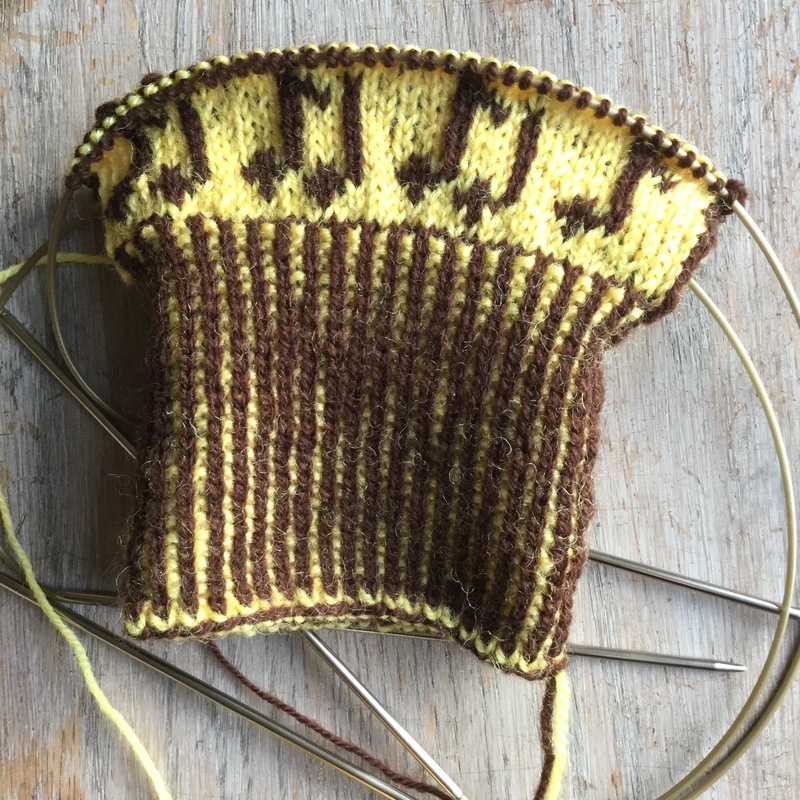 The Yorkshire tree of life pattern goes up the back of the hand and fingers. Here’s both hands, photographed on a marble table in a very cold wet Brittany, where Gordon and I are staying with our friend Francoise. Good knitting weather! A bientot! Someone asked me if I have a newsletter and I thought no I don’t but perhaps I could try having one. At least that way I might post more regularly. 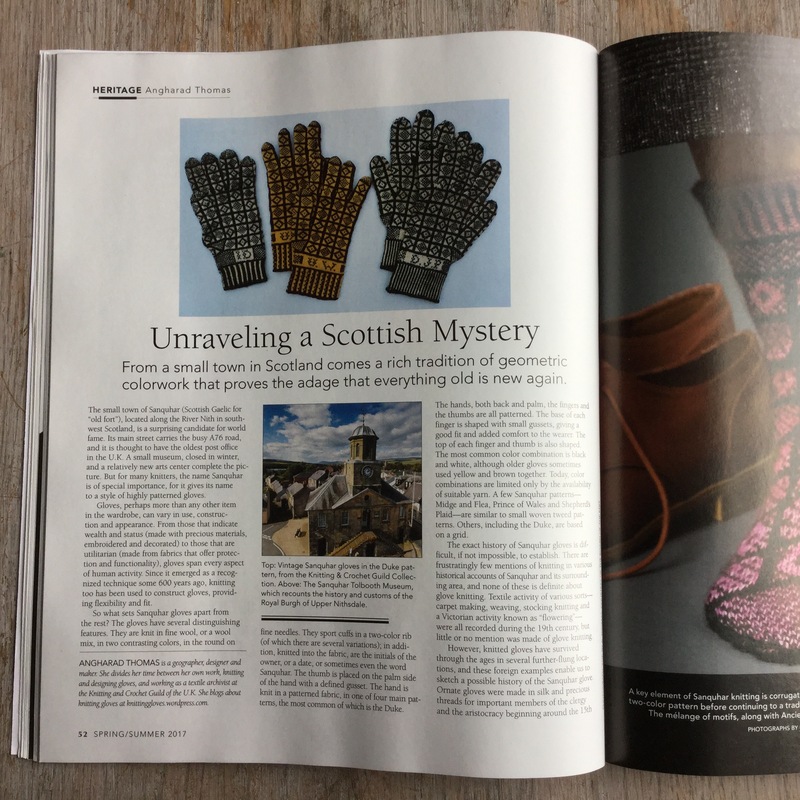 So, I had an article published in Vogue Knitting, about Sanquhar gloves. 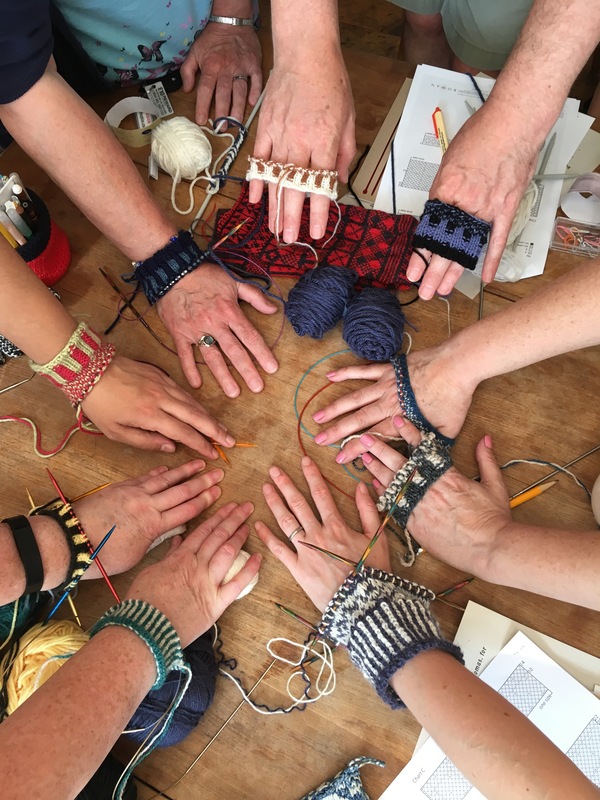 I felt extremely honoured to be invited to do this and very much enjoyed doing it, especially going to visit Sanquhar again, staying at the Blackaddie and meeting fellow glove knitter, May McCormick. 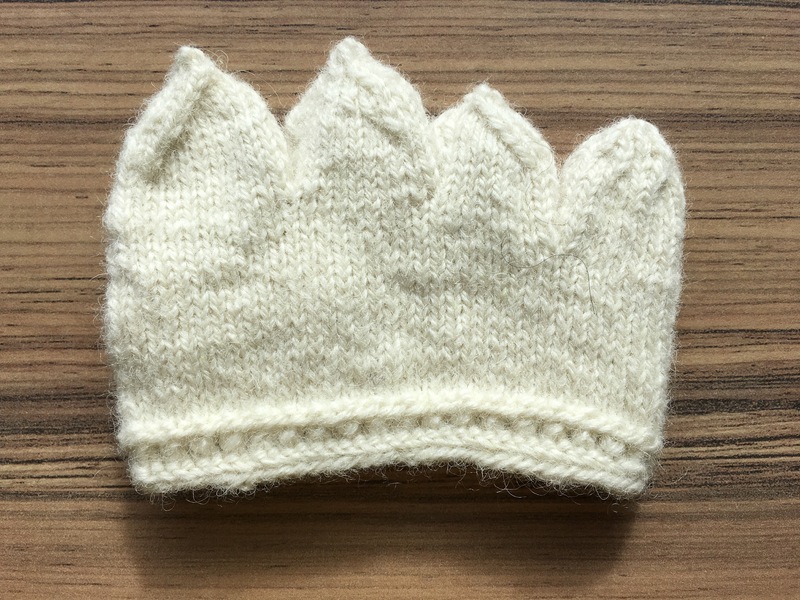 I have also opened a glove knitting Instagram account where you can find me as Angharadt. The pics are the same as what’s here though. My work got retuned from the Make exhibition at Ruthin Craft Centre after a lot of kerfuffle with the post office or Royal Mail. It turned out they were just trying to be helpful but t seemed as though the parcel had gone astray for a few hours. 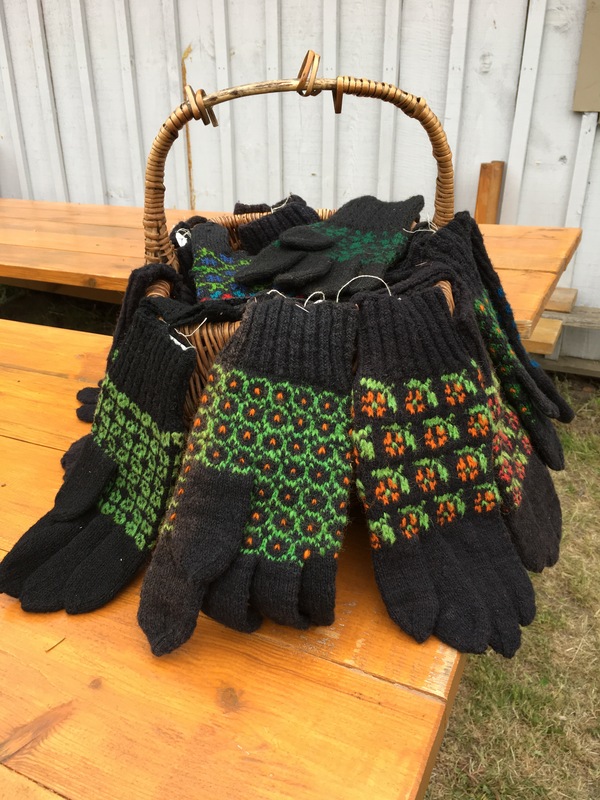 Finally, I write this from Latvia where I am attending a mitten knitting retreat. It is the last evening of a packed week in which we have seen other places than Riga, being based inThe southern city of Liepaja. We have seen more mittens than I would have thought possible and met more knitters ditto. I have tried techniques I’ve not even heard of and been to places I didn’t know existed. 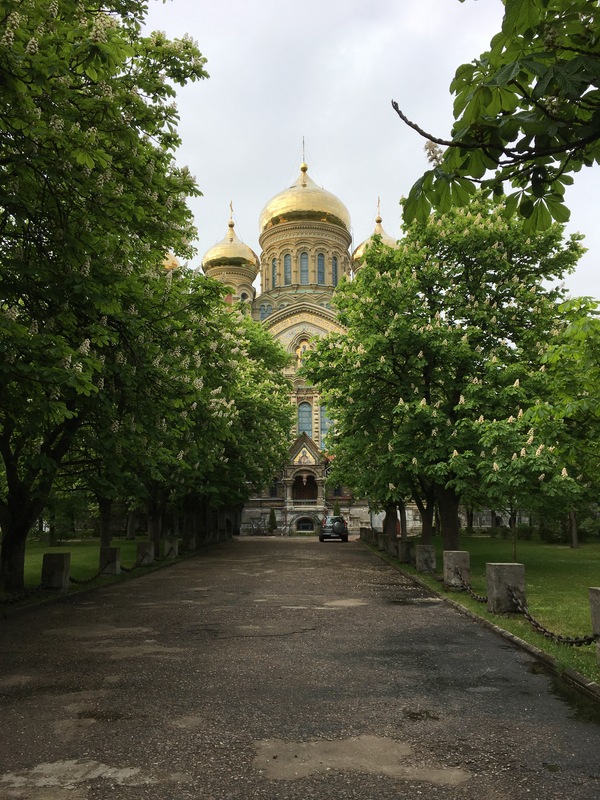 I’ll leave you with a picture of the Russian Orthodox cathedral here, the nearest I’m likely to get to the Kremlin.